Patti Smith | Will You Miss Me When I'm Gone? 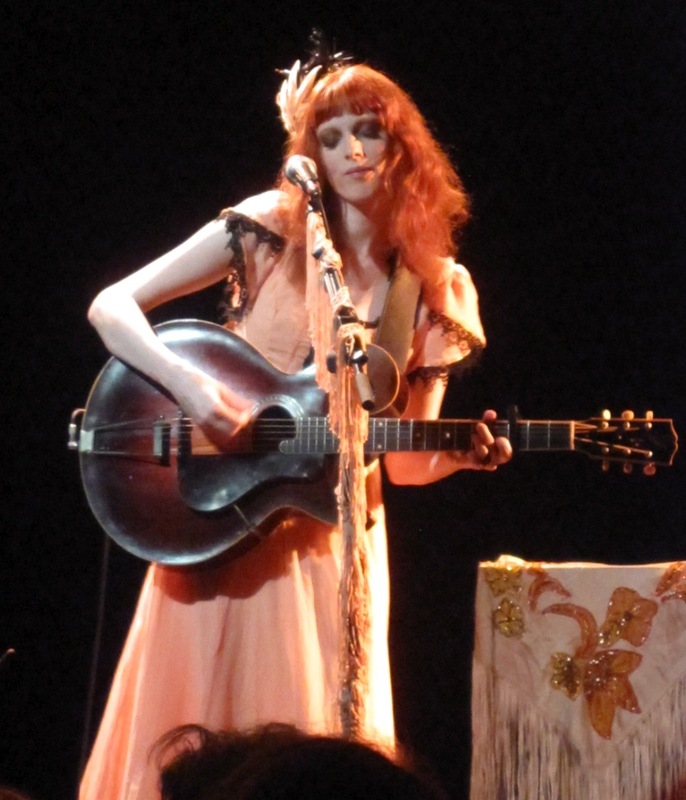 Call me jaded, but my expectations for Karen Elson‘s NYC solo debut at (Le) Poisson Rouge last night were not extremely high. I expected a short, but entertaining set of competent singing and playing. But what I got was much better than that. Supermodel Karen’s vocal chops are as shimmering and lovely as her amazing good looks. Cover art for Karen's album, The Ghost Who Walks. While it remains to be seen whether Karen (the willowy redheaded model also known as Mrs. Jack White) has staying power as a solo artist, she showed us that she certainly has the chops. She performed 13 tunes, backed by a five-piece band that included Jackson Smith (daughter of punk goddess Patti and Karen’s brother-in-law, by way of his marriage last year to Meg White, Jack White’s ex-wife) and the super-talented accordionist/vocalist/keyboard player Rachelle Garniez, a longtime cohort from the downtown NYC cabaret group The Citizens Band. 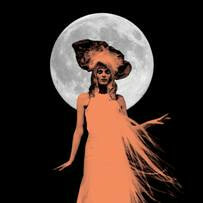 All but one song is from her upcoming album, The Ghost Who Walks, out May 25 on Jack White’s Third Man/XL Recordings. She also did her interpretation of “Milk and Honey,” a tune written by a New York folkie, the late Jackson C. Frank, and made more famous via covers by Nick Drake and Sandy Denny. Karen Elson at (Le) Poisson Rouge. The crowd at (Le) Poisson Rouge was not the usual NYC music audience. There were clearly a lot of people there from the music industry and the fashion world, including magazine editors like Vogue’s Grace Coddington (a famous redhead like Karen) and photographer Annie Leibovitz. Most everyone it the sold-out house seemed pretty respectful and paid attention to the music — something that’s often not the case when it comes to curiosity shows like this one. Those who attended last night hoping that Karen’s husband would show up were disappointed. There was no sign of Jackie White, of Jesse and Jackson’s mom, or Jackson’s wife. But that was a good thing, keeping the focus on the music. 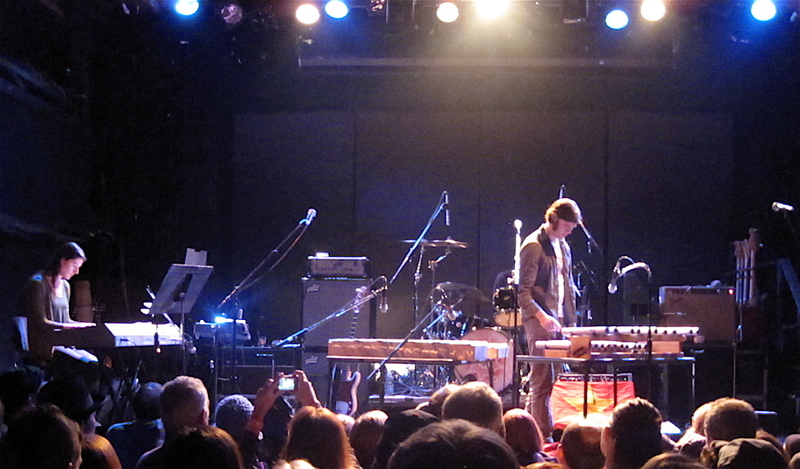 The opening act was an unannounced duo of a woman on keyboard and man on xylophone. Since they never introduced themselves and barely said a word during their largely instrumental set, I’m willing to bet that many people in the audience had no idea that they were hearing from Jesse Smith (daughter of Patti) and her musical partner Michael Campbell. They are an enormously talented duo. But their performing style and dour stage presence don’t make for an interesting set. Their music would be great for meditation or as a sonic backdrop, but their lack of dynamism hampers their ability to present themselves as a strong live act. Please click through to the jump for more, including Karen’s set list. Will You Miss Me When I’m Gone? 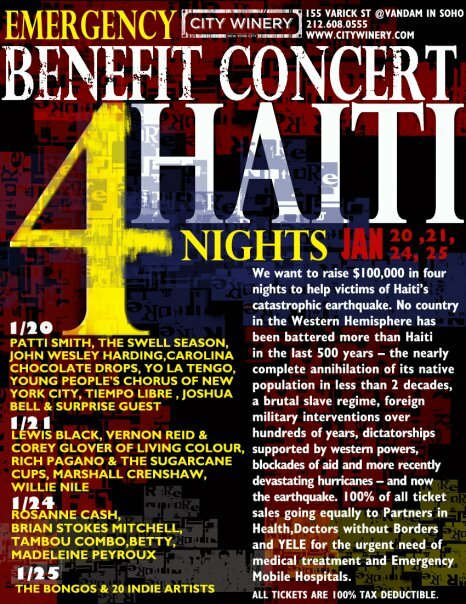 will be at the first of four nights of fantastic Haiti-relief. I’d like to make all four, but I’m not sure I have the cash (it’s $75 minimum, but it’s worth as it’s for an important cause!) or the free time to do that. But everyone who cares about music and about the tragedy in Haiti should try to make it to at least one of these shows. It’s a great way for music fans to make a contribution. All four nights are shaping up to be amazing. Patti Smith, Yo La Tengo, John Wesley Harding, comedian Lewis Black, Vernon Reid, Corey Glover, Roseanne Cash, Brian Stokes Mitchell, Carolina Chocolate Drops and many more entertainers of all types. City Winery promises that more will be added. 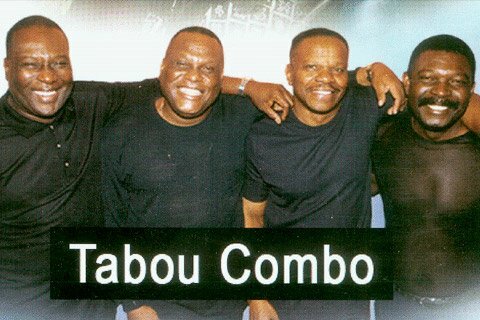 The third night (Jan. 25) in particular, should be a great party given that U.S-based Tabou Combo (misspelled on the poster as Tambou Combo), one of the longest-running bands specializing in an irresistible Haitian dance music called compas (or konpa direk), is on the bill. I haven’t seen TC in years, but by all accounts it remains an amazing dance band. City Winery’s goal is to raise $100,000 for Haiti relief over the four nights. Tickets ($75 general admission, $200 for Big-Hearted Donor tickets, which include a bottle of special wine) are tax deductible. Proceeds are being split among three charities: Wyclef Jean‘s Yele Haiti Foundation, Doctors Without Borders and Partners in Health. Click here for more info and to buy tickets. As of this posting, it seems that tickets are still available for all four shows. Showtimes vary slightly from 8 to 9 pm, so check the time when you buy tickets. Unlike many City Winery shows, these shows are all general admission — although the $200 ticket will get you into the VIP area. My advice to you is to ignore your New York concert-going instincts to arrive late. If you want a good spot, arrive on time. Or even early! The good people at City Winery assure me that the kitchen will be open for all four shows, so you’ll be able to pass the time until the show starts with eating as well as drinking. City Winery is at 155 Varick St., New York, NY 10013. Call (212) 608-0555 or email info@citywinery.com for more information. 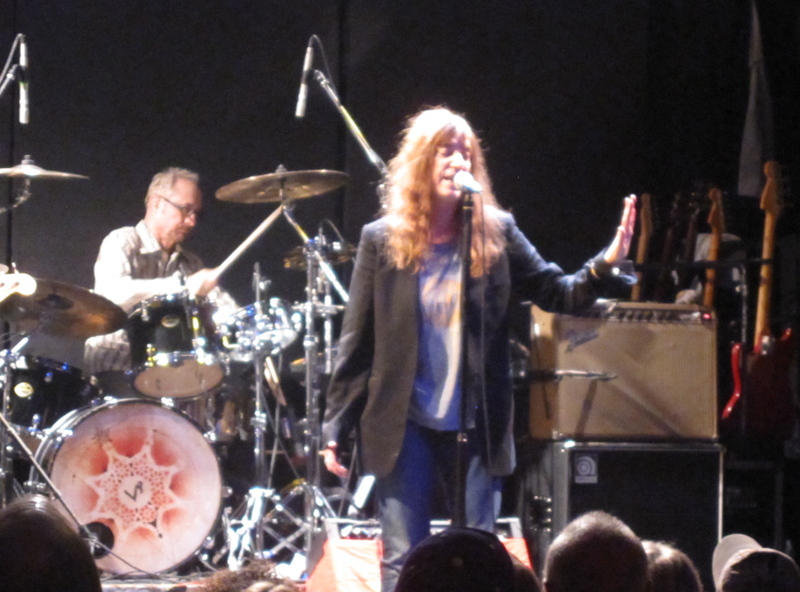 Patti Smith was still as giddy as a little girl last night, for the second of her three New Year’s shows at The Bowery Ballroom. She had reason to be happy — it was her 63rd birthday, or “burfday,” as she so charmingly says it. 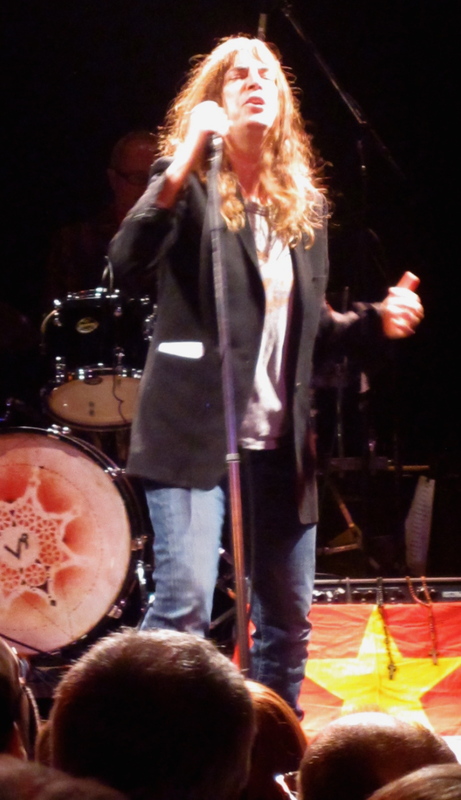 But, unlike the first night, Patti brought a bit more snarl and a lot more focus to the show. (She mentioned that The New York Times said she did some “bad things” on the first night. Check out that review, by Ben Ratliff, here.) The only slight disappointment last night was that the set list largely repeated the first night’s set. It was a spirited evening, though — good enough to make me regret my decision to skip tonight’s show to avoide the craziness of a Manhattan New Year’s Eve. 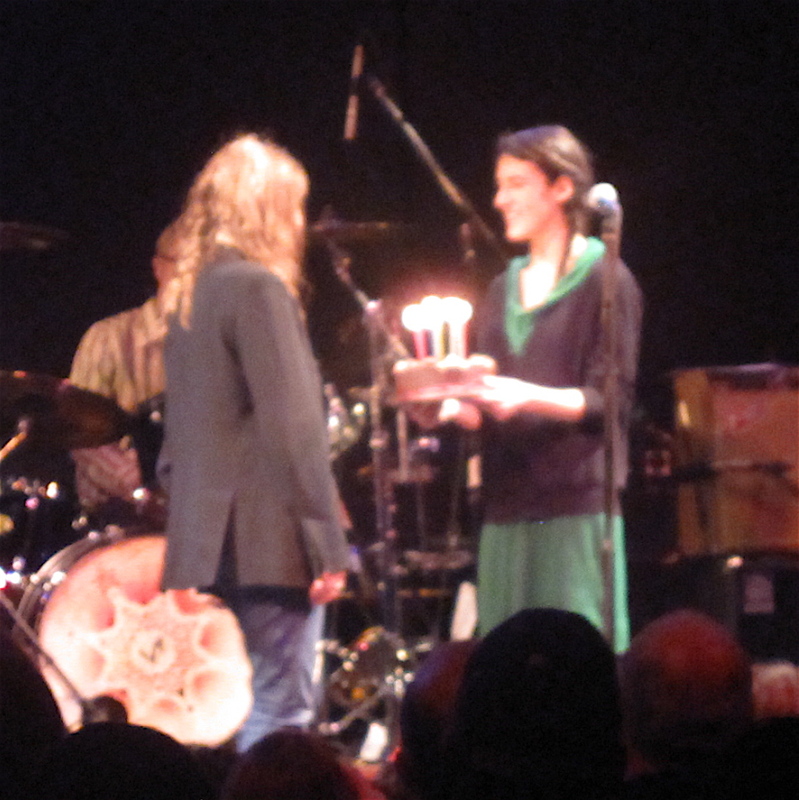 It didn't look like there were 63 candles on the cake that Jesse Smith brought onstage for her mom. But who's counting! 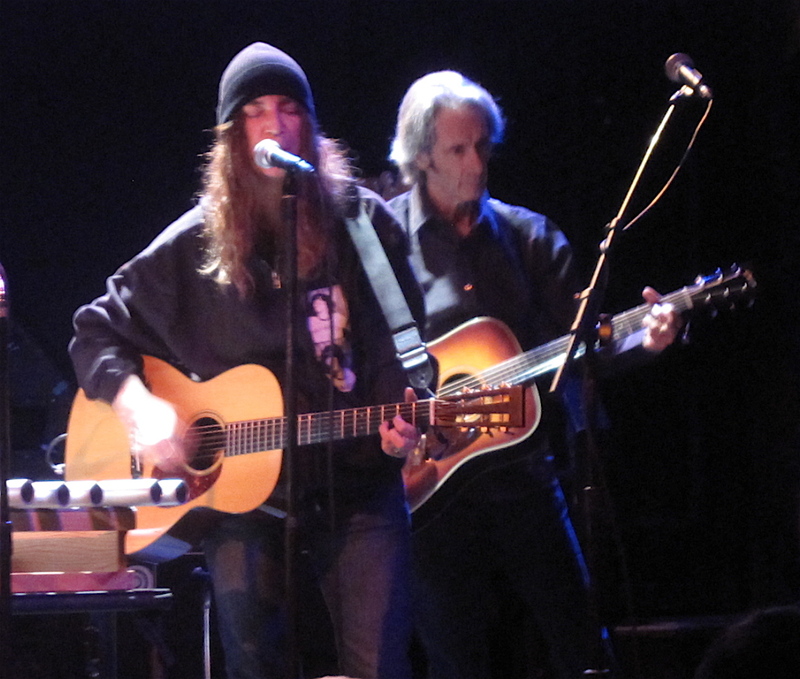 Patti Smith assured the sold-out crowd at the Bowery Ballroom last night that 2010 is going to be a better year. Not a perfect one, maybe, but better than 2009. And I think I can safely speak for the crowd when I say I sure hope she’s right. She reminded us that we’re having a blue moon this New Year’s Eve, and suggested it’s a sign of good luck. 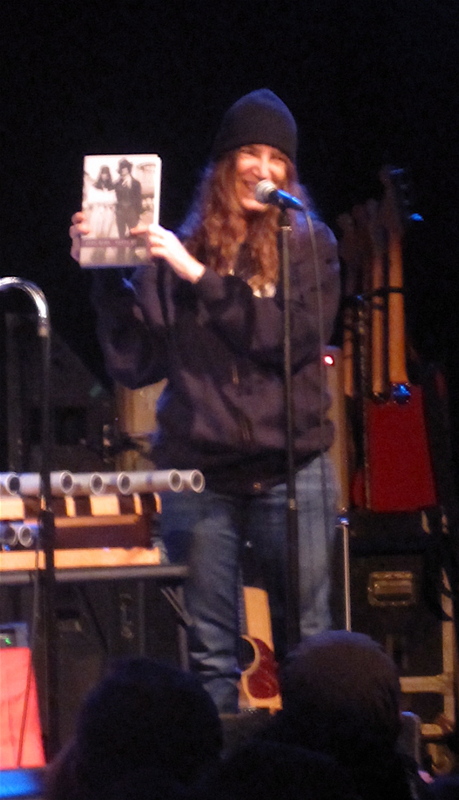 Patti shows off a copy of her new book, Just Kids, at the beginning of last night's show. Patti, who turned 63 today, kicked off her annual New Year’s run at the Bowery last night with a reading from her new book about her friendship with Robert Mapplethorpe, Just Kids, which is due out Jan. 19. She wandered onstage wearing a knit cap and a heavy black hoodie snatched right from her merch table because it was so cold backstage — and outside — last night. “I just got it on my way here tonight,” she told the crowd with her crooked smile. “It’s not like I’m trying to do a commercial. I’m just excited. … (But) I know you can’t download it. It was a bit about her first days in New York back in 1967, a perfect vignette. The evening quickly, but briefly, turned bittersweet as she memorialized three like-minded artists who died this year — including rock poet Jim Carroll and singer-songwriter Vic Chesnutt — by performing a beautiful acoustic version of Southern Cross with help from her longtime guitarist Lenny Kaye. After a round of applause, Patti surrendered the stage to daughter Jesse Smith, who said not a word during her 25 minute piano ramble, accompanied by drums. glockenspiel and tubular bells. Jesse seems to be a competent player, but is visibly uncomfortable and uncertain onstage. Every time I see her perform, I wonder why she’s up there. Unlike her brother Jackson, who did not play guitar with his mom’s band last night as he often does, Jesse does not give the impression that she was born for the stage. Jesse Smith and her band was the first-night opener. Later, Patti reminded us that “Lenny Kaye played in Jim Carroll’s band. I did other things with Jim,” as she introduced Lenny for a version of Jim’s Still Life. That one drew a laugh. 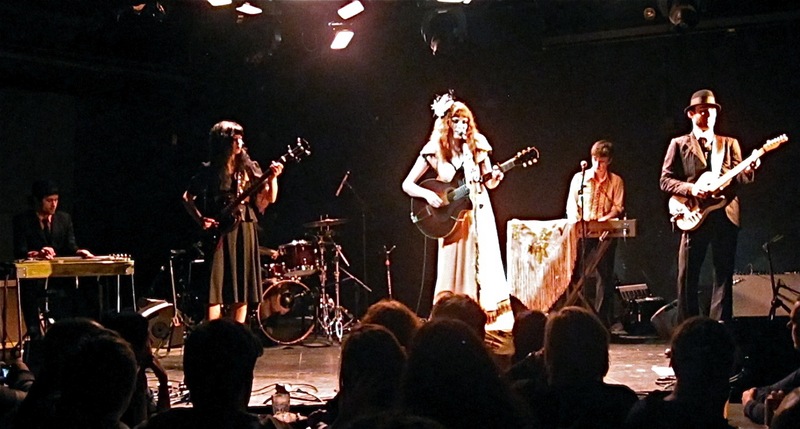 It was the first of two songs the band did without Patti – the second being a Tony Shanahan-led cover of Powderfinger in honor of Vic Chesnutt. There were plenty of other charming moments and laughs throughout the evening as Patti plowed through at least one song from just about ever album. And even though she told the crowd she was still fighting the residue of illness, she sounded great and never faltered — except when she forgot the words to songs from time to time as she inevitably does at every show.